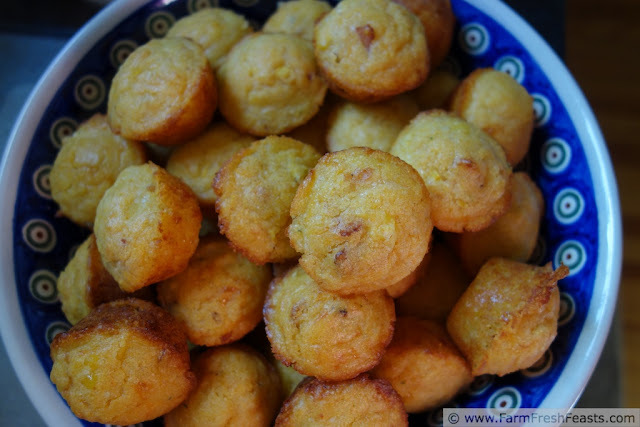 A savory cornmeal muffin with bacon bits and shredded cheddar, great with a bowl of chili. Now that 3/4 of my family is unable to enjoy corn on the cob, I've come up with other ways to enjoy the fresh taste of just-picked corn. Normally I'd boil the corn and serve it with butter and salt. Now, however, I boil it, cool it, cut the kernels off the cob, freeze them on parchment paper on a try, and transfer the frozen kernels to zip top freezer bags for long term storage. On a particularly Frugal Farm Fresh Eco Friendly Palooza day, I managed to cook the corn in the leftover canning water, but normally I boil it for 10-12 minutes in salted water. This savory muffin combination was suggested by my daughter. I'll probably keep making these after the braces come off. They are tasty! For other recipes using corn, please see my Corn Recipes Collection, part of the Visual Recipe Index by Ingredient. I've got more savory muffin recipes on the Recipe Index by Category -------> on the right sidebar. If you'd like to know how to Use This Blog, click here. Preheat the oven to 400 degrees. Spray muffin tin with oil spray or line with paper or foil cups. Mix buttermilk, oil and eggs together in a large bowl. Dump dry ingredients on top, and stir until just barely combined. Add cheese, corn, and bacon then stir until combined. Scoop** into prepared tin. Bake 15-18 minutes, this will make about 12 to 15 regular sized muffins. Or in a mini-muffin tin, bake for 12 minutes and this makes about 50 to 56 miniature muffins as pictured above. i'm looking forward to making these! that was from, kirsten. i like reading your new blog :) ~elisabeth. Elisabeth, glad you like it! Let me know how they turn out.